Lightning sand fulgurites are among the rarest geological specimens in the world. Created by one of nature's most powerful forces, a lightning strike bolt's temperature is hotter than the surface of the sun. The sand is literally "fried" into hollow tubes as the bolt drives its way through the ground at an incredible speed. These tubes, when found, can vary in size, texture, shape and color. The way the fulgurite appears and its consistency is very much determined by its location where it was discovered, the type of sand or soil the bolt traveled through, and how tightly the grains were compacted. 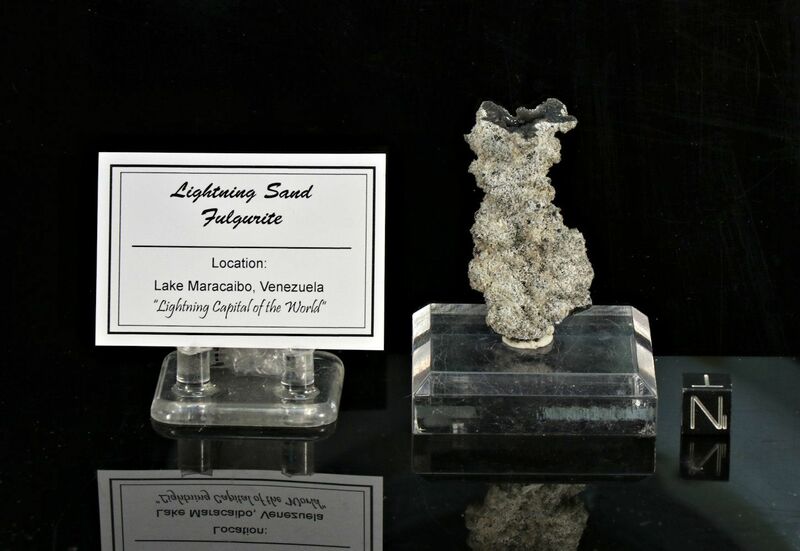 This all natural fulgurite lightning sand specimen has many "lobes" with a white to gray and some black exterior. It has a black glass lined interior with prominent hole at the top. We consider its exterior to be "exotic" as the multitude of lobes gives it a lot of character. This fulgurite came from the Lake Maracaibo region in Venezuela, which receives thousands of lightning strokes - with over 260 storm days per year! It is considered to be one of the lightning capitals of the world! The fulgurite ships in a see-thru perky box with the tag (pictured) and Certificate of Authenticity which includes a detailed description about fulgurite lightning sand. A tag stand included. Acrylic base and cube are not. This is an outstanding lightning sand fulgurite specimen.